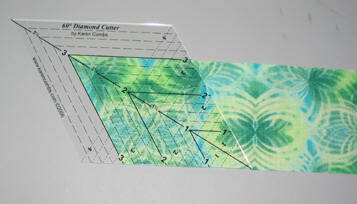 Click here to order the 60°Diamond Cutter Ruler. Cut strips desired width. This this example, we will use 3". Align bottom edge of Diamond Cutter along bottom edge of strip. Trim off side of strip. 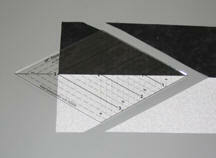 Slide Diamond Cutter and align cut side with the desired measurement on ruler. 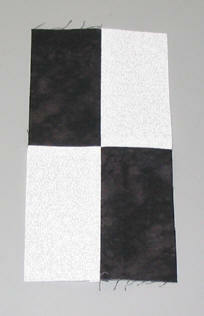 For this example, 3". This measurement should be the same as the width of the strip. 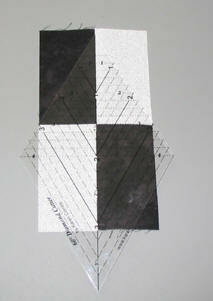 Cut single diamonds, realigning the ruler with each cut. 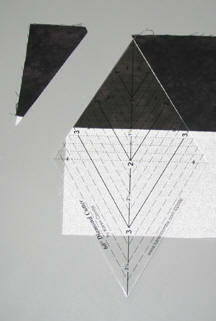 Realign ruler with each cut. 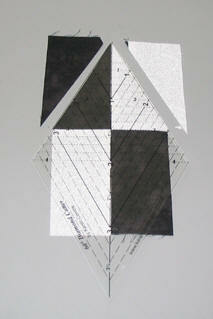 You may find it helpful to use transparent, low-tack tape to highlight the correct cutting lines. 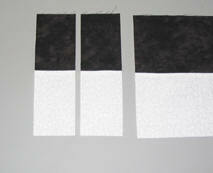 Cut strips desired width, following Cutting Chart, sew together using a 1/4" seam allowance and press seams open. 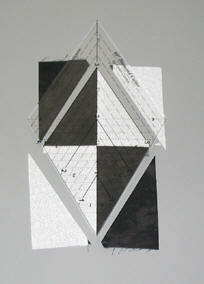 Place Diamond Cutter on top of sewn strips. Match dashed line on Diamond Cutter with the seam line. For this example, we are using 3". Cut along the top edges of Diamond Cutter, using a rotary cutter. 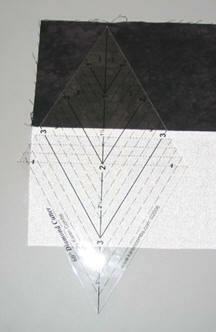 Turn Diamond Cutter, align cut edges with ruler and cut remaining two edges. 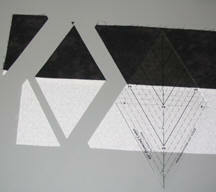 Cut desired number of diamond units. Place Diamond Cutter on top of sewn strips. Match center line on Diamond Cutter with the seam line. For this example, we are using 3". Cut two edges of the Diamond Cutter. 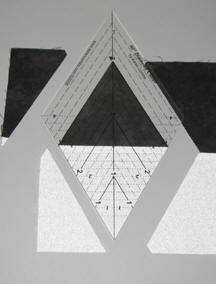 Rotate the Diamond Cutter, align the correct guide lines and cut remaining two sides. Cut desired number of diamonds. From sewn strips, cut rectangles, using second cut listed in Cutting Chart. Sew rectangles together to make unit. 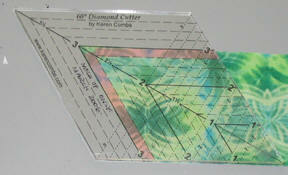 Match the center line on the Diamond Cutter with the seam lines. Cut top two edges of the Diamond Cutter.